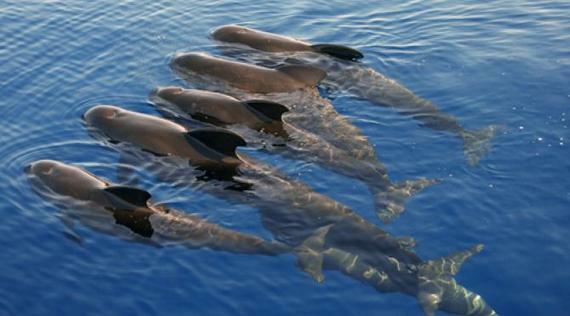 Cetaceans (whales and dolphins) are "Doctors of the Sea." We need every last one of them alive because the oceans are dying. Join Earth Dr Reese Halter from Los Angeles for another segment of SOS as tells of the 'War Against Nature' and the heinous ecocide in the North Atlantic. This year, the direct action international conservation group, Sea Shepherd, launched its largest and strongest campaign to protect the exquisite long-finned Pilot whales of the North Atlantic from the ocean-killing Danish Faroe Islander's Grindadrap (translation "whale murders"). It is truly the most repugnant, deranged and vile ecocide touted as a ritual that I am aware of. Not only is it psychopathic behavior, but also as you will soon see, deleterious to the entire population of Faroe Islander's. At 25 feet long, the male long-finned Pilots are amongst the largest dolphins on the globe. They are intelligent, socially complex sentient beings most worthy of our admiration and worldwide protection. These champion divers can easily surpass a 2,000-foot dive in search of squid, octopus, cod, dogfish, hake, herring, mackerel and turbot. These days long-finned Pilots must work very hard scouring for food because the oceans are fished-out from rapacious, subsidized, prolonged human ransacking of the seas. As governments continue to subsidize the killing of the Earth with $1.9 trillion annually handed over to big oil, gas and coal, their life-threatening pollutants, e.g. 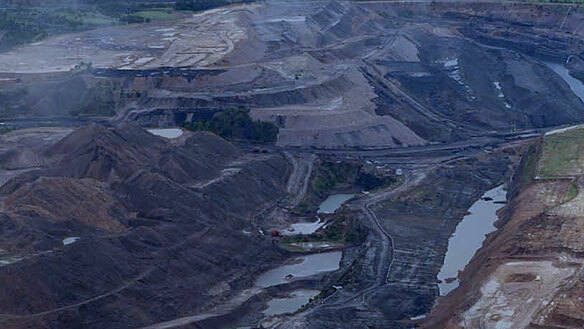 methylmercury, are accumulating within the oceans at a staggering rate. Recently my colleagues found levels of mercury from coal burned in Asia, likely originating from Australia's Galilee Coal Basin, in off the chart levels in a young Blue whale washed ashore near Santa Barbara, Calif. It turns out, frighteningly, that the Blue was far from the only highly contaminated cetacean to swim our seas. In 2008, The Faroe Island's Chief Medical Officer announced that the long-finned Pilots that were brutally corralled, then mutilated off the shoreline, were laced with toxic levels of mercury, PCBs and DDT. The Chief Medical Officer deemed all long-finned Pilots unsafe for human consumption. He noted that ingesting long-finned Pilots blubber or meat would result in: fetal neural damage, high blood pressure, impaired immunity in children, increased rates of Parkinson's disease and circulatory complications in both children and adults. 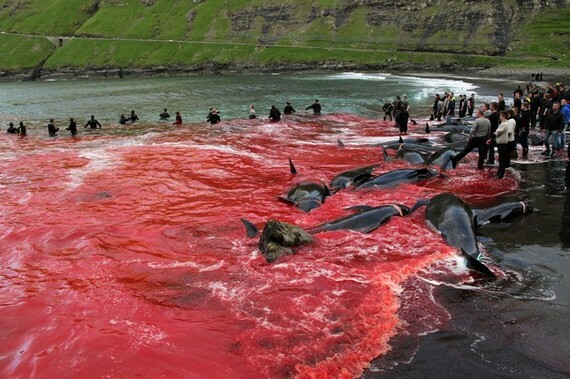 Last year, bloodthirsty Faroe Islander's murdered 1,104 long-finned Pilots. 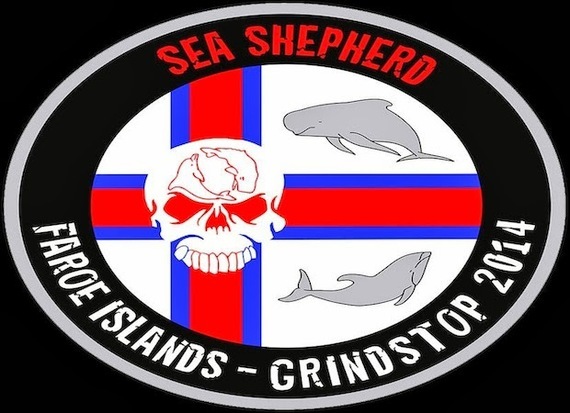 This year Sea Shepherd's Operation GrindStop, lead by two intrepid women: Lamya Essemali (France) and Rosie Kunneke (South Africa) are spear-heading a small group of unarmed, non-violent compassionate volunteers. 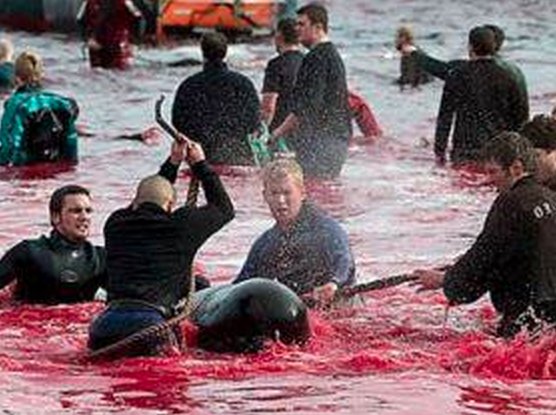 The fact that Denmark's Navy and Police condone the hideous annihilation of these remarkable mammals when the European Union, (of which they are a member) strictly forbids hunting cetaceans is rank hypocrisy, especially since these long-finned Pilots are toxic and unfit for human consumption. Why are all governments not rushing to reduce pollution instead of looting the oceans harder and faster than ever before? If each of us lend a helping hand, we have the power to prevent the death of the sea. Please protect the North Atlantic long-finned Pilots by supporting Operation GrindStop 2014. As Captain Paul Watson, founder of Sea Shepherd sagaciously says, "If the whales die, we die." Earth Dr Reese Halter is a broadcaster and biologist. His forthcoming book is entitled "Shepherding the Sea: The Race to Save Our Oceans."